A few weeks ago I received an invite for a Blogger's meetup at Pizza Hut. The meet-up was at their Clifton Branch (the one opposite Boat Basin) and the meeting agenda was to share the details of their Spring Fling campaign. To be honest, its been a while since I have had Pizza Hut. With so many new pizza delivery outlets opening up it's easy to forget about the chain that started off the pizza trend in Pakistan. More importantly, Pizza Hut is a brand that I have always associated with dining out - delivery is convenient but no matter how quickly the order comes, it just can't beat a pizza fresh out of the oven. The fact that there is no need to clean up afterwards is well icing on the cake! So while there might be new chains opening left, right & centre, when you need to go out for a traditional & comforting thick crust pizza, Pizza Hut is almost always the place of choice. Let's also not forget Pizza Hut for office farewells! ..
Moving on from where I sidetracked the conversation to the actual meetup. Currently Pizza Hut has an ongoing campaign titled 'Spring Fling' which you might have seen on billboards here and there. 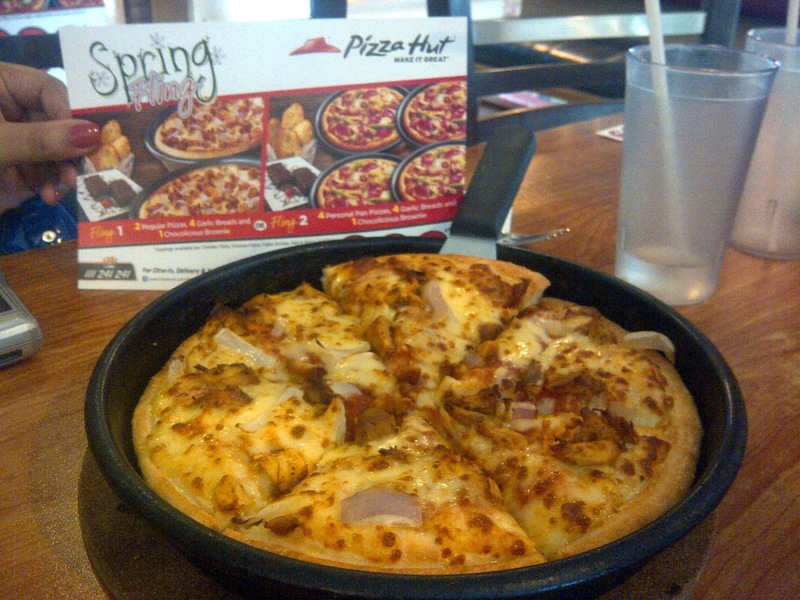 Aptly titled Spring Fling to signal the end of Winter in Karachi, it offers limited edition/seasonal meal deals by Pizza Hut. The outdoor & store campaigns (billboard & promo material inside the outlets) features the deals itself, using a flower themed background to indicate the spring element. However, on the social media front, the Spring Fling campaign utilizes two brand mascots titled Sherry & Veeni to generate a buzz and interact with fans on both Twitter & Facebook. The Spring Fling deal itself is simply a deal for 4 people with an appetizer (garlic bread), pizzas (of course) and dessert (one serving of their chocolate brownie). So basically if you order this deal, and you eat like a normal person (not like 4 large & hungry guys) it will cost you Rs. 292/head (inc tax) and if you add a pitcher to it, then it's around Rs. 350/head which is pretty good value for money! If you do eat like 4 hungry guys, then you need to pay extra and order more. They did serve the deal to us with all four flavors with a pitcher on the side. I am not going to review the food in detail because this was an invited event where I did not pay for the food. 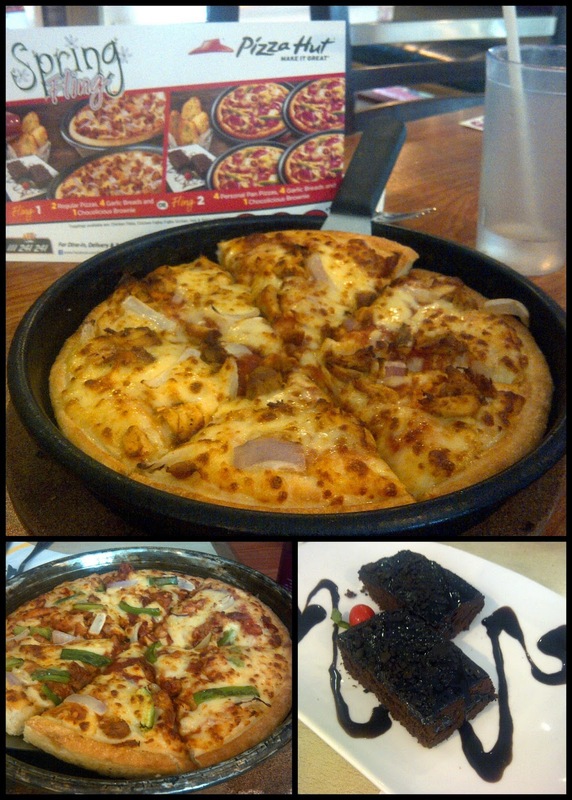 Secondly, its Pizza Hut and I am sure that almost everyone has had Pizzas & Garlic Bread from them at some time. If someone hasn't, then they need to! 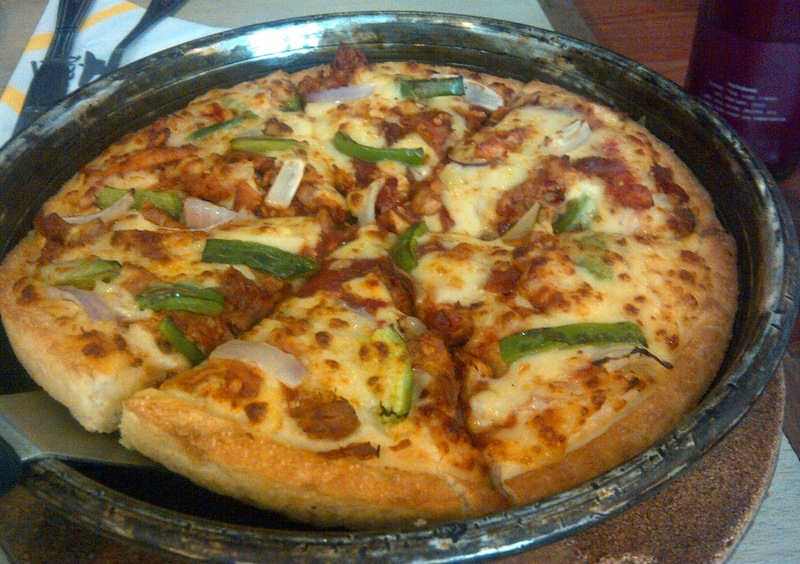 Everyone has to have Pizza Hut at least once in their lives, especially our Desified Chicken Tikka. However, in short, the garlic bread was hot & crispy, the Pizza was hot, loaded with cheese and had that traditional thick crust which is a Pizza Hut trademark. I will give some additional comments on the brownie since I was wondering if it was going to be enough and it was. 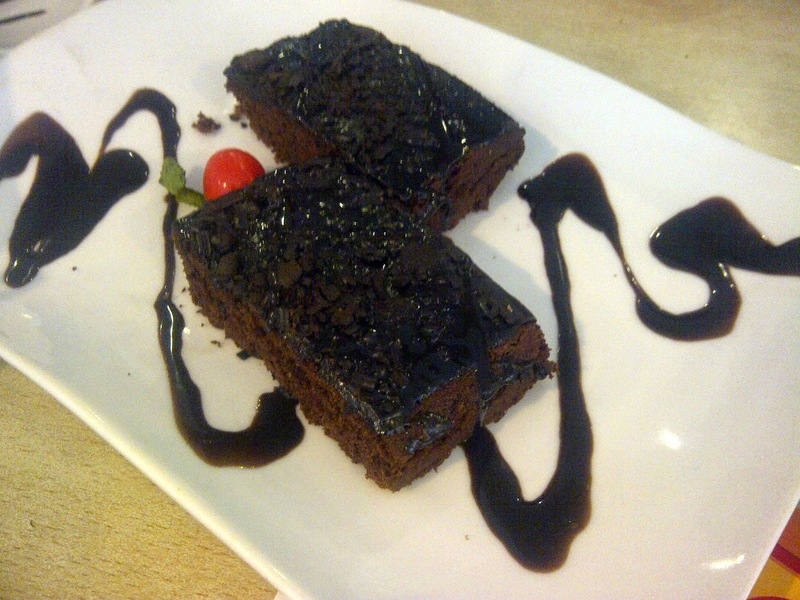 It is NOT one brownie, its actually one serving of chocolicious brownie (picture attached below) so two large pieces of chocolate brownie with chocolate sauce which is enough for 3-4 people. Overall, I really enjoyed the meet-up - the food, the company as well as the experience. There are people who say that these meetups are only a promotional gimmick and of course they are. However, it is also a good way for a company to get constructive feedback from relevant people on their campaign. I had started following Pizza Hut both on Facebook & Twitter once I got this invite, I noticed that there was a positive shift in the way that they were conducting their social media campaign. I can't be 100% sure whether it was a result of the discussion, but if it is then kudos to the team for listening to both the positive & the negative and improving on it. P.s. When ordering the deal, DO NOT leave the end crust! Being a Muslim, it is obligatory on us to finish whatever is on our plates. Additionally, think about all those less fortunate than you who don't have anything to eat.